Vegetables just keep coming up during this series, don’t they? 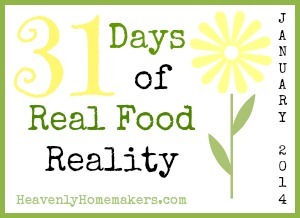 They are the best real food out there, so I can’t say enough about the importance of working them into our diets in a big way! 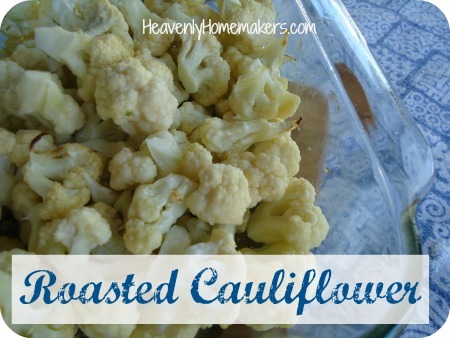 When I mentioned a couple of weeks ago on our menu plan that I was determined to make and eat cauliflower that week – you all really came through on some great ideas for ways to prepare it! Many of you told me that I had to try roasting the cauliflower. That definitely seemed like the easiest first idea to try. Here’s what I’ve learned since then: Not only is it a delicious way to eat vegetables, it’s also one of the easiest ways to prepare them. Roasting offers a slight variety in taste and texture, compared to steaming the vegetables as I usually do. I’m loving this, and can’t wait to continue roasting more varieties of vegetables as we work to expand our menu options. If you are taking baby steps in your real food journey, I encourage you to try roasting vegetables to serve with your meals. Healthy eating doesn’t get much easier! 1. Wash the fresh vegetables. 3. Place vegetable pieces into a casserole dish. 4. Drizzle on 1-2 Tablespoons of olive oil or melted coconut oil. 5. Sprinkle generously with sea salt. 6. Stir veggies to coat with olive oil and salt. 7. Bake in a 375° oven for 15-20 minutes or until veggies are lightly browned and tender. It really is that simple. Makes me wonder why I haven’t tried this before. Carrots, broccoli, squash, asparagus…what else would be a tasty roasted veggie? Brussel Sprouts – Drizzle with Dijon mustard, lemon juice & EVOO. They’re like candy! Oh Yeah, Brussels Sprouts are da bomb.com roasted! You mentioned my favorite roasted veggie… asparagus. My favorite way to do it is toss the spears with olive oil and salt, spread in a single layer in a baking dish, sprinkle 2-3 minced cloves of garlic over them, then roast 15 minutes at 350 degrees. When they come out of the oven, drizzle balsamic vinegar over them. SO GOOD!!! Try green beans! I love them steamed, too, but roasted is extra amazing. We love sweet potatoes/yams roasted in coconut oil. Asparagus is trickier–we tend to burn it accidentally. Zucchini cut in circles is super yummy; we put it on pizza after it’s roasted. But my FAVE is brussels sprouts…cut in half usually, tossed with a couple tablespoons of maple syrup, olive oil, lemon juice and sprinkled with salt and maybe herbes de provence. It’s my veggie candy! My favorite is an array of whatever you have on hand but onion is necessary then I add any and/or all colors of bell peppers, zucchini, sweet potato, diced garlic, carrots…. Cut all except onions into 1/2 to one inch pieces, (cut onions, red are super sweet, into thin strips) toss with 2 tablespoons of olive oil and season with herbs and spices of your choice. I like to add oregano or Italian seasoning, sea salt, pepper. Pour veggies into a 9″x 13″ cake pan and cook 35-45 min at 375, stir half way through cooking time. These are so good. I tried sweet potatoes just this week! I used olive oil, salt, pepper, and cinnamon. They tasted amazing, and my house smelled so good! I love roasted green beans! And one of my favorite things to roast is a combination of bell peppers and onions. I use them for chicken fajita, add them to a grilled cheese sandwich, and my favorite…homemade pizza topping! I love roasting veggies! I love roasting mixed root veggie:carrots, parsnips, rutabaga, beets, sweet potatoes. I usually toss with olive oil, add a fee cloves of garlic and a sprinkle of rosemary. These veggies need to cook for longer though. Also, I like to add italian sausage to the dish 30minutes before the end of cooking time. Complete meal with little to no effort! I love roasting veggies of all kinds! My favorite is to toss them with some of your Italian dressing. I love roasting veggies, too! It’s so easy and looks impressive. We like zucchini, green beans, potatoes, and sweet potatoes along with those you already mentioned. I especially like to choose two or three to roast together. So pretty on the plate. We like red skin potatoes, broccoli, bell peppers and onions roasted together. Try using a baking sheet instead of a casserole dish so that the veggies are not touching and steaming in the process. I think you will find the flavor much better but watch your time because they will cook faster. Laura, I have always hesitated to try the roasted veggie recipes because they say to toss the veggies in olive oil and roast in a very high temp oven. I have read here and there that the smoke point for olive oil is very low (probably shouldn’t put it in a more than 350 degree oven) and if you fry with it at a high temp or heat it in other ways (marinade for grilling, etc.) then it creates free radicals that can cause cancer. So it seems to be undoing the good we are trying to accomplish by eating more veggies! I know the tropical oils can take the heat much better (this is what I use for frying), but it becomes rather tedious to have to melt it then use to toss with cold meat for marinade only to have it clump up. How does it work for coating cold veggies? Have you heard anything to give you concern about using olive oil at high temps? Veggies roast just fine at 350 if you spread them out and don’t crowd them. You will also need to add more time but I do this when I have something else like a meatloaf in the oven and do not want to turn up the temperature. You are right that heating oils to high temps is not a good thing. The research I have done says that any oil turns to a transfat when heated. Butter does not. Coconut oil and palm oil are stable at any temp though. Is this what your research found as well? Sorry, I should have said that ANY plant or grain origin fats that are heated to 150 degrees or higher become saturated. When a fat becomes saturated it actually circulates in your blood and can become the plaque that accumulates in the arteries. I cannot give you a link for that because it comes from a textbook that I have studied in the process of becoming a natural healthcare consultant. Olive oil that has not been heated is the only preferable oil. I had the same clumping issue when using coconut oil in my fajita marinade. The marinade consists of Penzy’s fajita seasoning, water, lime juice and oil. Now, I simply omit the oil, THINLY slice the chicken strips, place in a shallow dish and stir a few times while marinating. I use coconut oil to fry the chicken in and it comes out fine every time. I do the same when marinating beef for Bee-Bim Bop. This marinade has soy sauce and sesame oil, so omitting the coconut oil doesn’t seem to be an issue. I fry the beef in coconut oil as well. Brussell Sprouts and Fennel are FANTASTIC roasted!! It is the only way I prepare them (we will eat raw too…but if they are cooked….than roasting is the method!) YUM! My favorite is asparagus, when in season of course. I snap the ends, leave the spears whole, toss with olive oil and salt, then grate parmesan cheese over the top. Makes for a super fast weeknight side, even my kids will eat. I made “beets and sweets” recently. Just some sliced beets, sweet potatoes and a little sweet onion with olive oil and seasonings. We loved it. Broccoli, asparagus, and green beans are our favorites. I toss them in olive oil, salt and a little garlic powder. Carrots are good too, and my husband, who hated carrots before, will eat a whole plate of them! I’m also a big fan of Jane’s Krazy Mixed Up Salt. So yummy! I use this technique with frozen veggies too…broccoli and green beans. So if you’re in a pinch and don’t have fresh veggies the frozen ones work well too. Try roast kale. Yum! It cooks up faster than other veggies, so watch it carefully. You can also make kale chips by roasting it until it’s dry. Soooo good! Confession. It wasn’t until last week that I realized that “roasted” was actually fancy code for “baked” (well, baked plus oil, salt, seasonings). Nor did I realize this could be done with vegetables. Try eggplant!! We love it with sweet potatoes, white potatoes, peppers, brussel sprouts, yellow squash, zucc, asparagus, green beans. I toss with melted coconut oil (expeller pressed – no coconut flavor)and garlic, salt and pepper and roast on lined cookie sheet with a rim. Coconut oil will start to harden when mixed with the cold veggies but will melt immediately in oven. Yum!